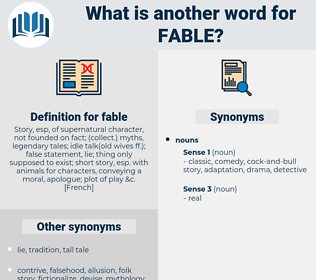 What is another word for fable? 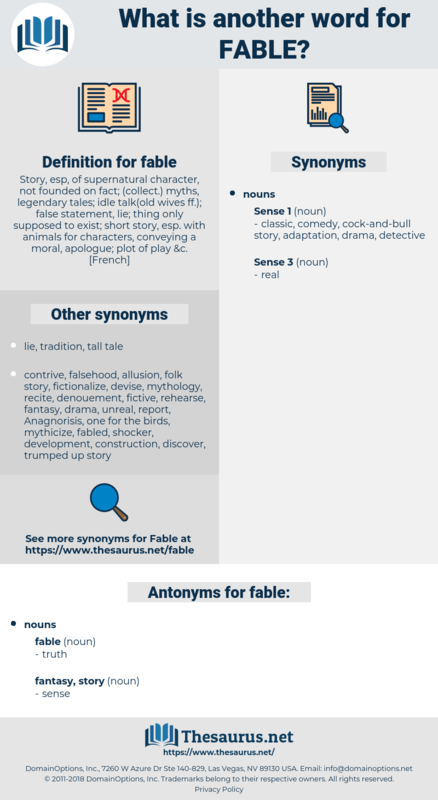 confirmation, actuality, narrative, authentication, substantiation, validation, veracity, fact, materiality, record, truism, history, truthfulness, realness, verification, verity, chronicle. Alarmed by their long absence, the widow, who at first received the message from the stranger, went herself to the cottage, and found that the story was a fable. To us who have our lives so largely in books the material world is always the fable, and the ideal the fact. feel, file away, fallow, fuel oil, flywheel, folly, fellah, fella, fall, folio, follow, flail, fail, foul, flay, flow, folie, foil, flow away, file, filly, fulah, fool away, fall away, flee, floe, fellow, flyaway, fowl, flea, falla, fallal, fula, foully, felly, faille, feeble, felloe, fibula, fool, Fa La, flyway, fully, fell, fl, Ful, flaw, flue, filial, full, fille, foible, fly, Fal La, fill, fuel, fipple, flu, foal.